In order to acquaint the interested reader with the Mount Olympus community and its property owners association (MOPOA), below is an outline of recent accomplishments and ongoing projects currently being undertaken by the Association. MOPOA is a very active property owners association representing over 400 properties which strives to improve the safety and quality of life of its members, and the aesthetic beauty of the community. Other Policies provide more detailed information on Maintenance, Use of Property, Architectural Review and Approval, Air Conditioning Controls, and Antenna & Satellite Dish Placement. All of these policies now are available on this website. MOPOA maintains Mt. Olympus monuments, including the re-planting of annuals on the landmark Mt. Olympus Entrance island. MOPOA funds the landscaping of the center median divider with Laurel Canyon Boulevard near the Mt. Olympus Drive entrance. MOPOA continues to see to the prompt removal of graffiti on Mt. Olympus common properties, including the white stone wall closest to the Mt. Olympus Drive entrance. MOPOA works with local law enforcement agencies and City Council officials to address reported incidents of reckless driving, loitering, graffiti and other criminal activity in the neighborhood, keeping these agencies informed of the situation and inviting them to attend MOPOA Board and community meetings in an effort to collectively work to mitigate these issues. As a result of the attention MOPOA has focused on these problems and with increased LAPD presence and enforcement, the number of such reported incidents has decreased significantly. MOPOA's Annual Membership meeting is usually held in late September or early October at the Mulholland Tennis Club. Notice will be sent out approximately 30 days prior to the meeting and one of the major meeting objectives is the election of Board Directors. All members are invited to run for office. MOPOA welcomes your participation. If you are interested in being a MOPOA Board member or working with the Board in some other capacity we welcome your help. Please let us know of your interest so that your name can be printed on the ballot before the Annual meeting. You can contact us by e-mail at mopoa@mtolympus-la.com or by voice mail at (213) 486-4555. Maintains personal contact with various City officers and agencies including, but not limited to, CD4 Council Office, Office of the Mayor, Hollywood and West Traffic LAPD Divisions, Hollywood Hills West Neighborhood Association, and various City Agencies such as the Departments of Transportation, Building and Safety, Sanitation, and others. Maintains signage, maintenance and landscaping of Mt. 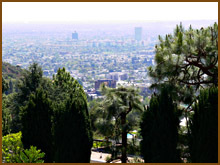 Olympus-owned properties including the entries off of Laurel Canyon Boulevard and Willow Glen Road along with the many dedicated monuments within Mt. Olympus. Provides a mediation service for disputes between members. Works with ADT/Bel Air Patrol to maintain and improve service and to enroll new residents and property owners to the current 24/7 dedicated car patrol. Maintains streets and gutters with weekly cleaning. Holds periodic Board meetings, an annual General Membership meeting and other functions, and staffs standing Committees to address the work of the Association. Provides advice, contacts and resources to its members. Develops written policies which interpret the CC&Rs.